I had the opportunity to stay with my friend, Wes, who moved to Bangkok about 6 months ago to pursue his passion for cooking at Le Cordon Bleu. He has been super hospitable and even let my friend, Levi, stay with us. Levi quit his job and is traveling just like me. Crazy thing is that we didn’t know that we were both doing the same thing until a mutual friend informed me. I arrived at 2 in the morning and Levi and Wes were out drinking which was perfect because I got dropped off close to where they were and we just walked back to Wes’s place. 1.) 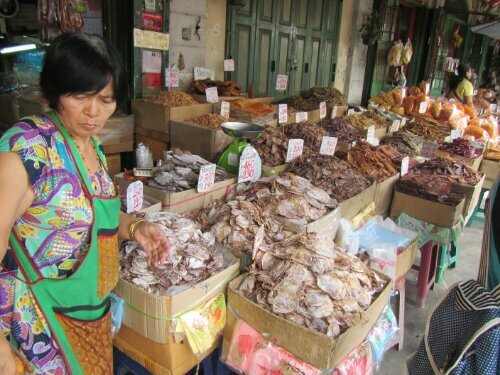 Great street food available on almost every street. 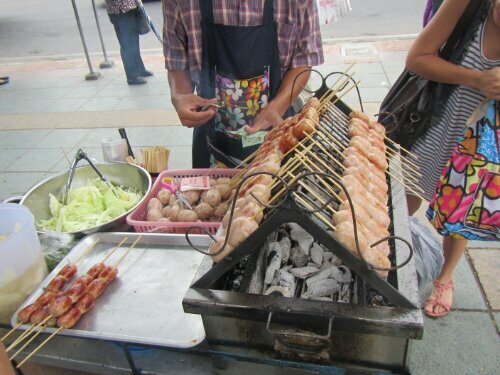 Great curry and noodle dishes and fried chicken and sausage and chicken on skewers. Fresh fruit like mango, lychee, jack fruit, watermelon. We even tried durian, which is a pungent fruit that smells like BO and onions. The consistency is soft like an avocado. It tasted like an avocado, onion and garlic mixture. 2.) Crazy drivers don’t slow down for pedestrians, yet there’s a method to the madness, just don’t hesitate and just go! Also, when crossing the street on a one way, look both ways! 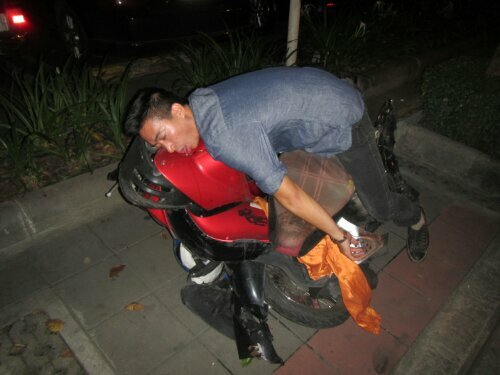 Thai sometimes drive on the wrong side, especially motorbikes. Wes got in a really hard accident. Jk see the pic below we found this wrecked bike on the side walk. Play it safe and take the BTS. It is really easy to get around and it’s a lot more advance than i thought it would be. Plus it is air conditioned which is a nice break from the hot humid weather outside. 3.) Very hot and humid, but the occasional rain cools everything down. It makes the streets really dirty, you’ll probably want to wear some tennis shoes instead of flip flops the streets can get really dirty. I’m glistening in most of my pics especially because we did a lot of walking. 4.) Grand Royal palace(where former royalty use to reside)- there is a dress code. You have to have your legs and shoulders covered. “Your pants are too short, you must cover!,” A man yells over loud speaker when we got to the entrance. Of course he wasn’t yelling at me because I was prepared! But for those who are not prepared, they rent out coverups, silly rainbow colored ones. 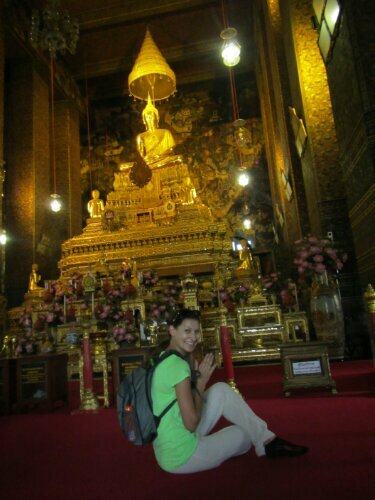 There were many temples within the grand palace. Some you could take a picture and some you can’t. 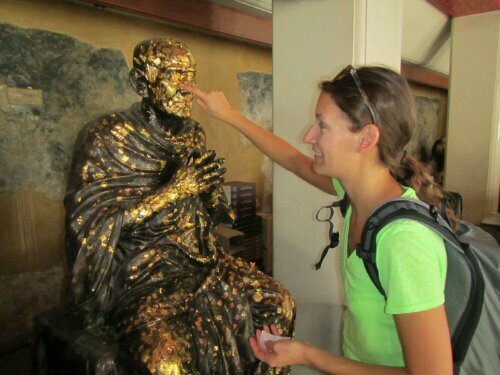 We bought gold paper to decorate the monks statute at the entrance of the grand palace. And you can shake a cup of sticks that have numbers until some randomly fall out. Somehow the numbers are interpreted, but let’s just say I’m playing the loto with those numbers. Wat Phra Kaee (which is on the same grounds as the grand palace) – We saw the emerald Buddha, which I thought would be a lot bigger, but he’s a little guy on top of a huge gold shrine. It is actually made of Jasper which is more of a marble green. Pictures are not allowed, so sorry no pic. Wat Pho – oldest and largest temple in Bangkok. 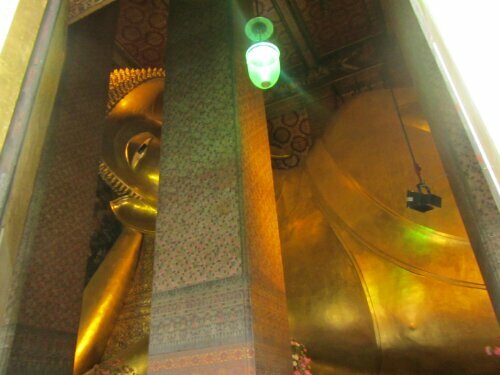 It houses the largest Reclining Buddha (15m high and 46m long) that’s a whole lot of buddha! The pose illustrates the passing of Buddha, which is ironic because he definitely doesn’t look like he’s dying. He has a little smirk as if he laughs at death. 5.) 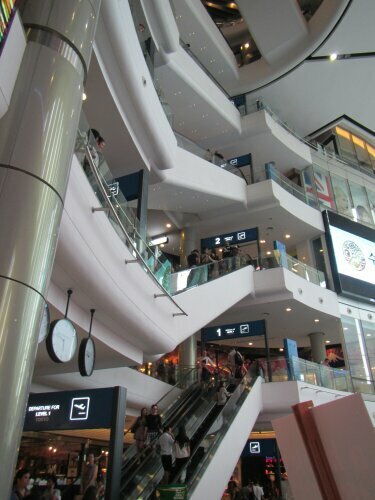 Terminal 21 Mall ­ A mall designed like an airport. Each floor has a different city theme. Each city is a major city like Hollywood, Istanbul, Paris and London. The bathrooms are design just like they would be in that particular city. For example, the toilets in London had a seat warmer and bidet with seat cleaner. 6.) Thai massage ­ Chaba on 11 soi Sukhumvit. They have you change in baggy pants and a shirt and lay on a thin mattress pad on the floor and curtains separate the different areas. 6 foot Levi was ‘too looong’ for a little 4’5″ Thai lady and my masseuses said ‘yo bady too skinnea’ They were cute and laughing the whole time while we were trying to enjoy it. Thai masseuse must be certified to give Thai massages, so if you see a certificate you should be good. In fact, in Chiangmai there’s a job training program for woman inmates, so you can stop into the local jail and get a massage. I want to go and try it, I just hope I don’t get a mean Thai lady that killed someone. 7.) Bangkok is super Americanized. Also, the Expat community is large and pretty hip. I tagged along with Wes and his expat friends to Sonic­ bar with dj’s, WTF bar with story telling sessions and a vintage market. There are tons of Americans and Europeans that get great international jobs here and they’ve made a pretty good expat community in Bangkok. 8.) This city never sleeps. There’s always something to do, just walk out on the street and grab a drink at one of the many tricked out vdub vans. Not sure about the betting system, but it looks like they bet amongst each other by signing with their hands and yelling. Each fighter does a ritual dance around the ring before the fight. They do it to each side of the ring. Traditional Thai music plays in the back while the fighters fight. It is a really fast drum beat with something that sounds like a bag pipe and a small symbol chime. It almost sounds out of synch; it gets your heart pumping. They kick to the kidneys and punch in the face and they try to grab the opponent’s foot to trip them. Caleb an American made his opponent bleed so much that it sprayed all over him; he was covered in his opponent’s blood. He’s from tigermuaythai, a training camp in Phuket. One of his team mates, Necdo, a South African, knocked his Thai opponent out. They literally had to take him out on a gurney. 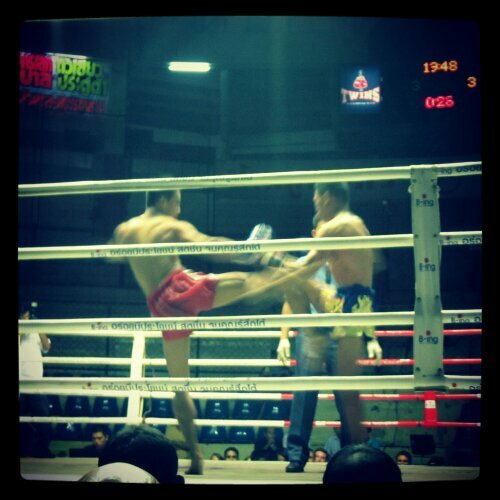 Both opponents were Thai. 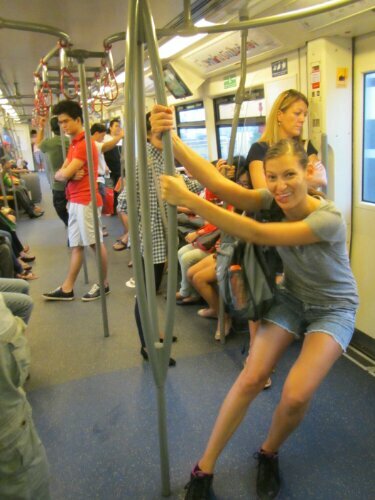 This Post was posted in Thailand, World Trip 2013 and tagged bandkok. Bookmark the permalink. Sounds amazing!!!! Your story made me laugh and got very excited for you sweet friend!!! Thanks! Glad you laughed!! When are you off on your trip?